Louis Einstein, a native of Germany, was born in 1847. At the age of eighteen he came to America and engaged in the dry-goods business in Memphis, Tennessee. In 1866, a relative of his, who resided in San Francisco, sent for him to come West, and he, accordingly, directed his course toward that city. Arrived there, Louis Einstein engaged as bookkeeper for the firm of Wormser Bros., remaining with them some time. He subsequently went to Portland, Oregon, and established a whole­sale liquor house. Three years later he returned to California, arriving in the San Joaquin Valley in 1871. 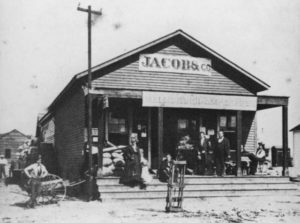 Louis Einstein at once associated himself in business with Elias Jacob, of Visalia, under the firm name of Jacob & Einstein. This successful firm operated two branch stores and did a large business throughout the San Joaquin Valley. In 1874, the pioneer business of Otto Froelich in Fresno, was purchased by Jacob & Einstein. Louis Einstein moved to Fresno, which was then only a village. With his partners he has operated the pioneer store, increasing its business from year to year, until now it has assumed enormous proportions. H.D. Silverman, who was originally interested in one of the firm’s branch stores at Centerville, was associated with Mr. Einstein during the first years of the business in Fresno, the firm name being Silverman & Einstein. When Mr. Silverman died in 1877, Mr. Louis Gundelfinger purchased his interest in the business, and the firm name was changed to Louis Einstein & Co. The partners have an equal interest, and the business management has con­tinued the same up to the present day, although Mr. Einstein devotes most of his time to banking affairs and is not actively engaged in the store. In December 1888, the Louis Einstein & Co. formed a stock corporation, using the same name as before, the capital stock being $200,000. This pioneer store is located in the heart of the town, and at one time it contained the post office, express office and telegraph office. In 1875 the brick building which the store now occupies was erected, and was the third brick building in Fresno. Besides being closely identified with the business above described, Mr. Einstein also has large interests in other enter­prises. Louis Einstein is the Founder and President of the Bank of Central California, which was organized in 1887. He is a stockholder of the Fresno Railroad Company, treasurer of the King’s River and Fresno Canal Company, and a stockholder of the San Joaquin Coal Mine Company. Einstein is a member and one time president of the Fresno Board of Trade. Louis Einstein was married in 1882, and has a family of four children.